In terms of the global warming issue, storing CO2 in reservoirs—or sinks—is desirable in order to keep the CO2 out of the atmosphere so that it does not contribute to ever-increasing atmospheric temperatures. 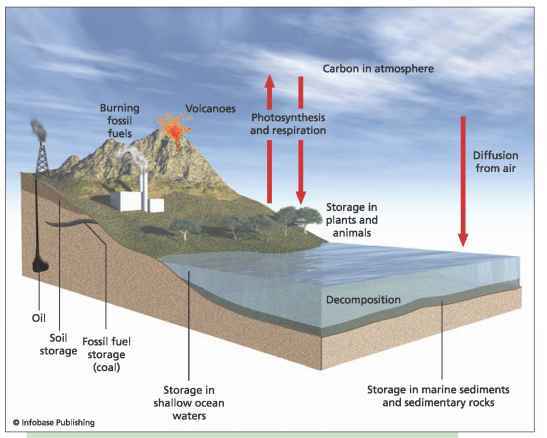 There are several mechanisms whereby carbon can be put into storage. During the process of photosynthesis, plants convert CO2 from the atmosphere into carbohydrates and release oxygen during the process. Trees in forests over a period of years are able to store large amounts of carbon, which is why promoting the regrowth of old forests and encouraging the growth of new forests are positive methods of com bating global warming. Vegetation sequesters 600 billion tons (544 billion metric tons) of carbon each year. In fact, the regrowth of forests in the Northern Hemisphere is the most significant anthropogenic sink of atmospheric CO2. When forests are destroyed during the process of deforestation and the land is cleared for other uses such as grazing, it removes a valuable carbon sink from the ecosystem. In areas where the forests are cleared through burning, this process serves to release the CO2 back into the atmosphere. In the oceans, as living organisms with shells die, pieces of the shells break apart and fall toward the bottom of the ocean, slowly accumulating as a sediment layer on the bottom. Small amounts of plankton settle through the deep water and come to rest on the floors of the ocean basins. Even though this source does not represent huge sources of carbon, over thousands or millions of years it does add up, becoming another useful long-term carbon store. Long-term exchanges involve storing anthropogenic-induced CO2 into the deep ocean, where it will stay in a sink for a significant amount of time. The world's oceans are currently holding huge amounts of CO2, helping to minimize the effects of global warming. As the oceans become saturated, however, they will not be able to store as much CO2 as they have previously. Currently, about half of all the anthropogenic carbon emissions are absorbed by the ocean and the land. At the ocean's surface, the water becomes cooler as it flows toward the polar areas. As water cools, the CO2 contained within it becomes more soluble. The temperature of the ocean plays a critical part in how the seawater behaves. The currents in the ocean transport enormous amounts of heat. As water is moved from the equator to the poles, the seawater becomes cooler, which makes the CO2 more soluble. Therefore, in the cold water areas of the world's oceans—such as the polar regions—more CO2 is absorbed from the atmosphere by the cold ocean water. Conversely, in the warmer ocean waters—such as the equatorial region—the ocean releases CO2 to the atmosphere. As global warming continues and the ocean water temperatures also continue to rise, the oceans will not be able to store as much CO2 as they have been—the warmer the water, the less CO2 it will hold; more CO2 than expected will remain in the atmosphere to heat the air. This exacerbating problem will only increase the effects of global warming, creating a vicious cycle. The phytoplankton that currently exists in the oceans are also important organisms for taking in and storing carbon. According to a report in National Geographic News in June 2001, a team of 23 scientists led by Stephen Pacala, a professor of ecology and evolutionary biology at Princeton University, ran a study to determine how much carbon is stored in sinks in the United States. There are two different methods that can be used to determine an amount—one based on an atmospheric reading, the other on a ground reading. Intending to collect data as thoroughly as possible, the researchers gathered data from carbon absorbed by houses, soils, landfills, and silt in reservoirs. According to Pacala, "We found out that the land sink was bigger than had been reported by other analyses—about twice as big." The scientists determined that the forests and other land areas in the United States absorb from one-third to two-thirds of a billion tons (30 to 60 billion metric tons) of carbon every year. In contrast, the United States emits about 1.4 billion tons (1.3 billion metric tons). According to the researchers, the amount of carbon being stored in sinks in the United States is currently so large because many of the areas that were once "clear-cut" and logged to make way for agriculture and urbanization in the past century are now regrowing new vegetation, which is also serving as a sink. Pacala also points out that part of this sequestration is the land reabsorbing large quantities of carbon that were released during intense farming and logging activities in the past. "When we chopped down the forests, we released carbon trapped in the trees into the atmosphere. When we plowed up the prairies, we released carbon from the grasslands and soils into the atmosphere. Now the ecosystem is taking some of that back. But, the sink effect will steadily decrease and eventually disappear as U.S. ecosystems complete their recovery from past land use. The carbon sinks are going to decrease at the same time as our fossil fuels emissions increase. Thus, the greenhouse problem is going to get worse faster than we expected." A sink can also become a source if the situation changes. Carbon can also enter the cycle from several different sources. One of the most common is through the respiration process of plants and animals. Once a plant or animal dies, carbon also enters the system. Through the decaying process, the bacteria and fungi break down the carbon compounds. If oxygen is present, the carbon is converted into CO2. If oxygen is not present, then methane is produced instead. Either way, both are greenhouse gases. A major source into the carbon cycle is through the combustion of biomass. This oxidizes the carbon, which produces CO2. 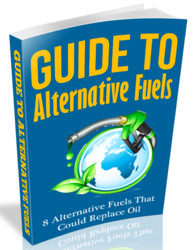 The most prevalent source of this is through the use of fossil fuels—coal, petroleum products, and natural gas. Fossil fuels are large deposits of biomass that have been commonly preserved inside geologic rock formations in the Earth's crust for millions of years. While they are preserved in rock formations, there is no release of carbon to the atmosphere. However, as soon as they are processed into fuel products and used for transportation and industrial processes, millions of tons are released into the atmosphere. According to the Environmental Protection Agency (EPA), the burning of fossil fuels and deforestation releases nearly 8.8 billion tons (8 billion metric tons) of carbon into the atmosphere each year. Another major source of CO2 in the atmosphere is from forest fires. 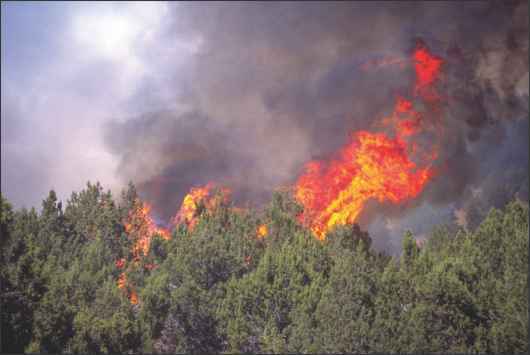 When trees burn, the stored carbon is released to the atmosphere. Other gases such as carbon monoxide and methane are also released. After a fire has occurred and deadfall is left behind, it will further decompose and release additional carbon into the atmosphere. One of the predictions with global warming is that as temperatures rise, certain areas will experience increased drought conditions. When this occurs, vegetated areas will become extremely dry; then, when lightning strikes, wildfires can easily start, destroying vegetation, increasing the concentration of CO2 gases in the atmosphere and warming it further. Another source of carbon occurs near urban settings. When cement is produced, one of its principal components—lime (produced from the heating of limestone)—produces CO2 as a by-product. Therefore, in urban areas this is another factor to consider; areas of increasing urbanization are areas of increasing CO2 concentrations. floating in the world's oceans, also use some of the CO2 to make their food through photosynthesis. The Earth's zones of permafrost are another potential source of CO2. According to the Oak Ridge National Laboratory in Tennessee, if climate temperatures continue to rise and cause the permafrost soils in the boreal (northern) forests to thaw, the carbon released from them could dramatically increase atmospheric CO2 levels and ultimately affect the global carbon balance. According to Mike Goulden, a scientist working on a NASA project to determine the net exchange of carbon in a Canadian forest, "The soils of boreal forests store an enormous amount of carbon." to 30 percent of the carbon stored in the terrestrial biosphere. Most of the carbon is located in deep layers 16-31 inches (40-80 cm) below the surface, where it remains frozen—the zone called permafrost. The reason that the permafrost layer is so high in carbon is that the decomposing plant material accumulates on the forest floor and becomes buried before it decomposes. With the steady increase in atmospheric temperatures over recent years, some of the permafrost has been experiencing deep-soil warming and been melting in midsummer. This process releases CO2 through increased respiration. According to Goulden, "Assessing the carbon balance of forest soil is tricky, but if you've got several pieces of evidence all showing the same thing, then you can really start to believe that the site is losing soil carbon. Our findings on the importance of soil thaw and the general importance of the soil carbon balance is already influencing the development of models for carbon exchange." What Goulden is hoping to accomplish in the future is to find a way to use satellite data to improve carbon exchange models. There are several human-related sources of CO2. By far, the largest human source is from the combustion of fossil fuels such as coal, oil, and gas. 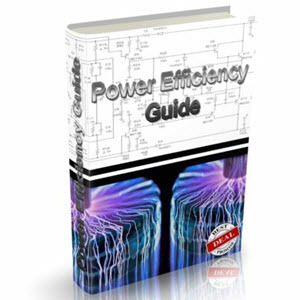 This occurs in electricity generation, industrial facilities, from automobiles in the transportation sector, and from heating homes and commercial buildings. According to the EPA, in 2006, petroleum supplied the largest share of domestic energy demands in the United States. This equates to 47 percent of the total fossil fuel-based energy consumption during that year. Coal and natural gas followed, at 27 and 26 percent, respectively, all heavy producers of CO2. Electricity generation is the single largest source of CO2 emissions in the United States, according to the EPA. This is one reason why the EPA began their ENERGY STAR® program, geared toward the production and use of energy efficient appliances. Industrial processes that add significant amounts of CO2 to the atmosphere include manufacturing, construction, and mining activities. The EPA has identified six industries in particular that use the majority of energy sources, thereby contributing the largest share of CO2: chemical production, petroleum refining, primary metal production, mineral production, paper production, and the food processing industry. The carbon cycle is enhanced by human activities. As fossil fuels are burned for transportation, industrial processes, heating and cooling of homes, farming, deforestation, and other activities, additional carbon is released into the atmosphere, upsetting the natural balance. In the residential and commercial sector, the main source of direct CO2 emissions is due to the burning of natural gas and oil for the heating and cooling of buildings. The transportation sector is the second-largest source of CO2 emissions, primarily due to the use of petroleum products such as gasoline, diesel, and jet fuel. Of this, 65 percent of the CO2 emissions are from personal automobiles and light-duty trucks. • production and consumption of mineral products such as cement, lime, and soda ash. Also important are industrial processes that produce other harmful greenhouse gases as by-products, such as methane, nitrous oxide, and fluorinated gases. These gases have a far greater global warming potential (GWP) than CO2. Methane's global warming potential is 23, nitrous oxide is 296, and fluorinated gases range from 6,500 to 8,700, posing an even more critical negative effect.